borough boundaries by the back door? At a press gathering on 22nd October 2010, the Rt Hon Eric Pickles MP (Con) - the local government secretary - was wheeled out to announce that the tri-borough merger between Hammersmith and Fulham, Kensington and Chelsea and Westminster Councils would collectively save them a "£100 million." He was flanked by the three Conservative council leaders who all nodded enthusiastically as their minister explained how it would all work. By Christmas, that figure had fallen to "£50 million" and now, in the papers that went to H&F’s Cabinet Meeting last Monday night, it is "£33 million" across all three authorities. So what went wrong? First imagine, for a moment, being one of Hammersmith and Fulham Council’s most senior officials and hearing that the Administration is considering the possibly of merging your job with similar jobs in two other London councils. Add in the same thing happening in the two other local authorities and you begin to get a picture of the anxiety, panic, plotting and horse-trading that has almost certainly ensued across the three councils? There are in fact high failure rates for mergers of all kinds, in both the private and public sectors, so learning from others’ mistakes would seem obvious and sensible. But no best practice models have been followed and no independent advice from some type of critical friend (such as an academic or government advisor) has been sought. Instead, H&F’s Chief Executive, advised me that the three administrations have allowed the directors of their councils to solely “work things out for themselves as they go along.” In the latest paper, the three administrations actually boast that their DIY proposals have been put together “in house” without any outside input. With the greatest respect to the directors, that is like putting the turkeys in charge of what to kill for Christmas and, surprise, surprise… In this case, it ain’t turkey. My fellow Labour councillors and I are in favour of making back office savings and last year we published radical plans to do just that in our manifesto. I believe merging some post and many back office ancillary services with other organisations is a positive and necessary way forward. But H&F Conservatives’ record on “efficiencies” has, to say the least, been controversial to date. With one hand they have awarded vast salary hikes to their senior bureaucrats. With the other, they have introduced new stealth taxes, cut many front line services, sold off community assets such as youth clubs, schools and libraries and weakened the public’s right to influence the administration whilst making horrible cuts to front line jobs, terms and conditions. It is therefore reasonable to question what they’re actually doing. So let’s begin by considering what’s happening in the most expensive aspect of the council’s back office management. Hammersmith and Fulham currently have five Borough directors on an average salary of around £220,000.00 per year. None of the department directors are amongst the many staff losing their jobs and H&F will actually be gaining an extra tri-borough adult services director. According to the TaxPayers Alliance, our Borough has some of the highest paid bureaucrats in the United Kingdom. Compare H&F to Hackney, for example, which is a much bigger borough but their Chief Executive is on nearly £50,000.00 less than our average. It would have been eminently possible to save our Borough another £250,000.00 by cutting the number of directors in H&F and not going ahead with those proposed super-directors (and joint Chief Executive) jobs that are to be shared with the other councils. Now consider the other extreme and review how this merger will affect front line provision. A good example is the children’s and education services. On the 8th June my colleague, Cllr. Caroline Needham (Lab), and I met with H&F’s Andrew Christie, who the Conservatives have made the “designate director of children’s services” for all three councils. Mr. Christie explained that of the £11.5 million that would be saved in his new department a total of “£5 million” would be cut from Hammersmith and Fulham. Caroline questioned why our residents would suffer the burden of almost half the total cuts. She was told that was because our borough had “a higher base of services” to cut from. Mr Christie also explained that “merging similar services is easier when councils have similar resources levels.” Put this together and it means critical services would be cut to meet the lowest rather than the highest common level of resourcing. It’s evident that resources won’t be the only things homogenised across the joined up departments. If stealth taxes such as parking, child care and disability care fees become the same it’s hard to imagine anyone dropping theirs. These will rise to the highest rate. Services will be cut to the lowest level as will the terms and conditions of front line staff. But all of these are political factors that can be resolved with a change of administration. There are technical problems which have not been properly dealt with either. Officials agreed that it would be highly possible (and I think likely) for a super-director and their team, working across the three boroughs, to move money from one to the others without ever being found out. Therefore, you could have a situation were an administration in Hammersmith and Fulham, for example, invests an extra amount of funding for better local children’s centres but the tri-borough managers reallocate a proportion of that funding to Westminster because they believe the centres there are under resourced. Resource shunting like this is a common problem in merged organisations. “Trust that it won’t happen” was the advice offered from one official after much cross-examination but I don’t believe “trust” is an appropriate mechanism for ensuring public money is properly accounted for. That leads us to question what happens if one of our merged partners suffers some type of crisis. Westminster’s balances have dropped from over £70 million to around £11 million in less than two and a half years. Officials have briefed me that Westminster City Council has some serious problems to contend with. So at the very least, it is possible that officials paid for by H&F’s tax payers end up spending the largest share of their time sorting out that council’s problems instead of dealing with the concerns of H&F’s residents. As attributes go, this doesn’t make Westminster the most attractive of marriage partners. I asked officials why these two boroughs were chosen to be H&F’s partners. It’s because the Conservative “politicians get on well with each other and have a lot in common” came the reply. That’s not the greatest of reasons. I can see the logic of sharing some services with Kensington and Chelsea Council – indeed; the last Labour administration did precisely that but not Westminster – especially given its difficult circumstances. So maybe there is some truth in the allegation that the overall objective for this merger is an attempt to gerrymander a more comprehensive political union between the three Conservative run councils and do away with current borough boundaries before the voters have a chance to kick any of them out at the next elections? These are tough times for local government. If Labour were in administration in this borough we would do everything possible to keep taxes low and protect front line services. Merging back office jobs with other bodies and seeking new ways to deliver high quality services would be key considerations. But that would all have to be done properly. It is vital that best practice is followed, critical friends need to be on hand to offer objective and sometimes uncomfortable advice, the vested interests of senior bureaucrats needs to be managed and the public and even our political opponents would need to be involved on all matters likely to affect local democratic accountability. The three Conservative administrations have not done any of this. Indeed, their level of secrecy about all these matters is a real concern. Maybe all that was what Cllr. Stephen Greenhalgh (Con), H&F’s Council Leader, was nervous of the Opposition asking about at the Cabinet Meeting on Monday night. He would not allow any questions. I gave a statement much along the lines of what’s written above. Cllr. Greenhalgh looked uncomfortable but went on to tell us that these proposals were simply “phase one of the programme.” It was unclear exactly what he was referring to. What is clear is the advice given to me by H&F’s Chief Executive last December. I asked him about any risk analysis that had been undertaken. “There’s been none” he replied so I pushed him a little more. “Well, service failures and loss of public money are the real risk if any aspect of this goes wrong” he said. 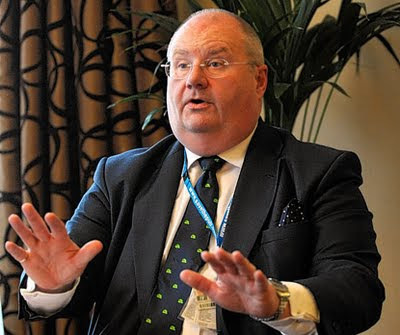 Given that, and considering that they have missed their £100 million savings target by a country mile, it is astonishing that Mr. Pickles and his three Conservative Council Leaders have taken such an unorthodox approach to their particular scheme. It begs the question why? But you only have to scratch the surface to see there is much that the three administrations are trying to hide.